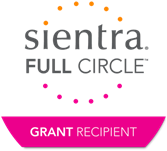 Breast Cancer Angels has been chosen as one of Sientra’s FULL CIRCLE™ grant recipients in the amount of $20,000. In its inaugural year, Sientra’s first-in-kind charitable program funds were distributed to a select group of deserving nonprofit organizations such as yours who we felt were the most committed to making a meaningful difference in improving lives of patients with breast cancer. Your application demonstrated one of the most promising visions for the future of furthering breast cancer aid, research, patient outreach and advocacy, and prevention.